On 22 July 2018, Dr. Jayanth Murali, IPS (Indian Police Service) is running a half marathon for promoting organ donation. What makes this organ donation awareness campaign extra-special? The Additional Director General of Police (ADGP), Director, Directorate of Vigilance and Anti Corruption is running the half-marathon with his mouth duct-taped! MOHAN Foundation took this opportunity to speak to him about his motivation. Q. Can you tell us about your journey as a marathon runner? A. Running was my favourite go-to stress buster for a long time. I was more of a gym runner and I used to do most of my running on the treadmill. Outdoor running happened occasionally to me, mostly while on tours due to lack of access to a treadmill. I would run at least ten kilometres on my treadmill each time, clocking an average of minimum50 kms a week. As I was approaching my 50th birthday, a friend suggested that I run a marathon. In 2012, on my 50th birthday, I ran my first half marathon having registered for the Chennai WIPRO marathon. Soon afterin Feb 2013, I ran the Auroville full marathon. I have never looked back since. Q. How many marathons have you run so far? A. I have run a bunch of half and full marathons. Put together I have done more than twenty of them. Q. What inspired you to take up the cause of Organ Donation? A. Both my daughters are very caring and compassionate towards homeless and sick people and even care for stray animals. They don’t miss an opportunity to help anyone in distress. One day, my daughter informed us that she had enrolled herself as an organ donor and showed us the card where she had pledged her organs. I was touched beyond words. I decided then and there to stop living for myself. I decided to dedicate my life to the cause of poor, sick and needy. I discovered supporting organ donation helped in the aforesaid cause as well as it helped the sick people with organ failure get a new lease of life. 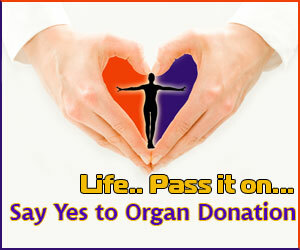 I have been supporting organ donation since then. Q. This year you are aiming for something special. What is it? A. This year I am planning to create a new record by running the entire length of half marathon with my mouth duct taped. I have also decided to dedicate the record to MOHAN Foundation. When the mouth is taped, the only option to breathe is through the nose and this makes running extremely difficult, especially in long distances. Mostly runners while running long distances breathe through mouth or combination of mouth and nose, as more oxygen is required by the body. Mouth-breathing brings more oxygen than breathing in through the nose. Hence it's difficult to run while breathing only nasally because the delivery of oxygen is extremely restricted and forcing air through nostrils tightens the jaw and creates tension as well as breathlessness. Q. Has anyone run such a marathon before? A. I searched the Internet to see if someone had attempted this feat in the world in the past but my search did not reveal any such attempt having been made in the past. If nobody has run a marathon tape-ducting the mouth , I might probably be the first in the world. MOHAN (Multi Organ Harvesting Aid Network) Foundation is a nonprofit, non-governmental organization promoting organ donation in India since it's inception in 1997. A torchbearer in the field of organ donation in many ways, MOHAN Foundation started advocating this very difficult cause at a time when the environment was fairly hostile towards this highly taboo topic among the public. MF’s unique mission is to ensure that every Indian suffering from end stage organ failure, be provided with the gift of a new lease of quality life through a lifesaving organ. During the Dream Runners Marathon in Chennai, South India on July 22, MOHAN Foundation is organizing an enrolment drive during which volunteers can come forward and get enrolled as organ donors.